The Nutmeg State is one of the most heavily urbanized states in the Union, with more than 88% of the population living in cities. 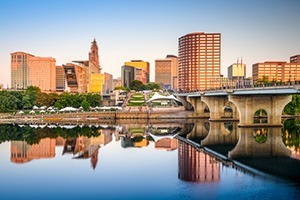 Connecticut is a major center for insurance and there is no wonder that its residents are keen on employee benefits. Hartford is an insurance capital and its workforce is familiar with the workings of the law. It is because insurance deals so much with legal issues that these type employees respond very well to group legal plan benefits. Many of the problems that crop up in urban areas require a lawyer's help. This can be issues such as landlord – tenant problems, immigration, estate planning, and family law, among others. Connecticut residents have a better understanding than most about claims filings and litigation that may end up in small claims court. It is why having a group legal plan available means of a lot to them. Countrywide Pre-Paid Legal Services have been working with employers since 1987 to help provide their employees with needed legal assistance. Employer/employee matters are not covered under the benefit but other concerns are. The voluntary payroll deduction legal plans developed by Countrywide can help employees deal with issues arising with landlords, as well as any property rights. The Countrywide group legal plan also allows for review of legal documents. Anyone in the insurance industry knows how important that benefit can be for the average person. This is in addition to providing help in areas such as living wills, medical power of attorney, and documents to protect the state of an individual. Countrywide has benefits that are very easy to administer and service comes quickly. It is something that all members of a Countrywide plan come to appreciate. The Countrywide plan is something that an organization of any size can provide for the workforce. Just like any other kind of employee benefit, these voluntary payroll deduction funded legal plans cover a potential risk. When the Personal Legal Protector Plan is used, this employee benefit may spell the difference between security and complete financial disaster. A Countrywide group legal plan permits access to some of the best attorneys in Connecticut. The coverage is highly affordable and keeps legal expenses under control. It permits a person to have incredible peace of mind. Countrywide does more than help with access to attorneys and controlling legal fees. Identity theft is becoming a major problem, and anyone who shops on the Internet has a right to be concerned. The Platinum ID Protector Plan helps a person monitor his or her credit scores and also has $25,000 worth of identity theft insurance. It can help a person deal effectively with attempts at destroying his or her credit reputation. The protection granted by a Countrywide group legal plan is why so many employees appreciate having it in their employee benefits package. A group legal plan funded with a voluntary payroll deduction is something any human resources director would recognize as being valuable. And for all you history buffs, the state still has one connection to the days of the sailing ships. The state animal, believe it or not, happens to be the sperm whale. Granted, a certain one legged sea captain wasn’t looking for legal assistance, but a Countrywide plan would have certainly helped him in a personal injury suit. Countrywide can help create a plan that will give the legal assistance needed for personal injury, estate planning, or any number of problems that can burden an employee’s shoulders. Helping these hardworking folks with legal issues can start with just one telephone call to Countrywide. It can end with the kind of legal support that employees will greatly appreciate.